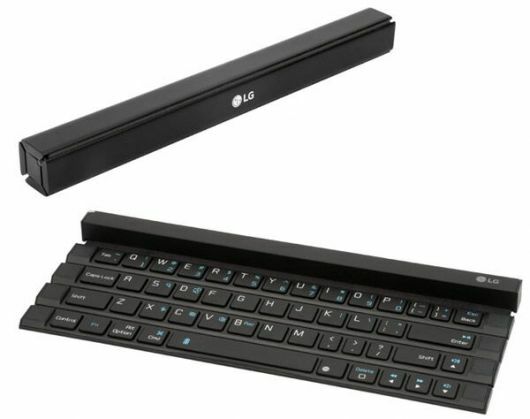 Korean electronics giant LG has announced a Bluetooth keyboard, Rolly. According to the Verge, Rolly folds up along the four rows of keys into a stick that can be put in a purse or pocket. The Rolly is made of solid plastic which gives it a more tactile feel. LG claims that it is also supposedly more comfortable because it is just smaller than the 18mm key pitch found on most desktop keyboards. The two tiny plastic arms fold out from the end of the keyboard to support a tablet or smartphone and it can toggle between two different Bluetooth-connected devices at a time. Battery life is an expected three months on a single AAA battery.